Seasonal allergies affect a large number of the human population. For some of us, these allergies become so intrusive that they can affect our daily lives in a very negative way. Itching, sneezing, watery eyes, runny nose, and coughing are all symptomatic of seasonal allergies. While undesirable, there are certain approaches which can be taken to assist in alleviating the degree of aggravation and unease which come along with these pesky seasonal allergies. It’s easier for adults to handle these seasonal allergies because they can generally recognize the symptoms as they approach and they know to begin using over the counter medications, prescribed medications or do their absolute best to avoid the outdoor allergen aggravates. Children with seasonal allergies, on the other hand, seem it to have a harder time as they do not know why suddenly they’re getting fussy or their eyes are itching and start running and then hey begin to have trouble focusing in school or just about anywhere really. It becomes more challenging for children to be active in sports as they’re coughing and dealing with runny noses. At StickyJMedical, we believe that is incredibly useful and truly important for children to have necessary alert wares for the allergens they are sensitive to. We suggest an engraved medical alert bracelet or an engraved medical necklace which can be easily worn and accessed to let adults accompanying them be aware of the strong allergic reactions they have to the list of contributors of seasonal allergies. The big one that affects most of us is pollen. We suggest getting children who have a strong allergy to pollen a unique, fun and durable medical ID bracelet or necklace which says: Pollen Allergy with specific instructions as to how to assist the child if they begin to experience a strong allergic reaction to it. We offer an amazing variety of allergy alert bracelets for children and adults too. 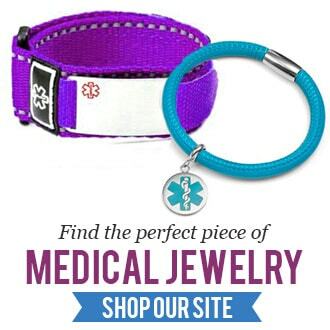 Visit our site today to find safe, fashionable and long wearing seasonal allergy alert jewelry! Our new gemstone bracelets will rock your world!